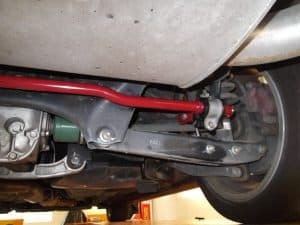 With reference to this topic, I prefer to use the terminology of Anti Roll Bar or Anti Sway Bar as compared to Sway Bar or Roll Bar as it is the function of the Anti Roll Bar to “Reduce” the “Body Roll Angle” of the motor vehicle. It is very true to say that the question of Anti Roll Bar fitment has been a much-debated issue of recent times. Within the complicated quest for optimum handling and balance of your motor vehicle, should the anti roll bar be up there as a critical integral part of consideration for your set up……? Yes, of course it should be. Consider for a moment the emphasis all high-end levels of motor sport place on the importance of anti roll bars…. From road going standard production motor vehicles, sedan racing and open wheel race cars, anti roll bars are a critical component for optimum suspension performance and vehicle balance control…..
An anti roll bar is basically a spring in the form of a torsion bar with right angle ends (lever arms) that link both sides of a suspension system with the connection completed using sway bar links…. I accept that anybody reading this will know what anti roll bar looks like and how they mount under the motor vehicle. The objective of the anti roll bar is to increase the roll stiffness of the motor vehicle. As cornering forces are introduced into the suspension system, the vehicle body will start to roll on the springs. Without the fitment of anti roll bars, it is only the vehicle springs that are providing the resistance to this rolling moment force. 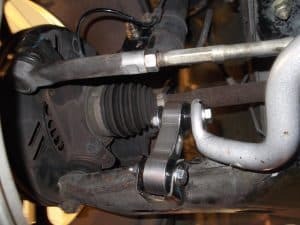 The installation of an anti roll bar then adds to the stiffness of the spring, further increasing the roll resistance. Of equal importance is that optimum suspension geometry and wheel alignment camber settings can be better controlled and maintained with reduced body roll angle. 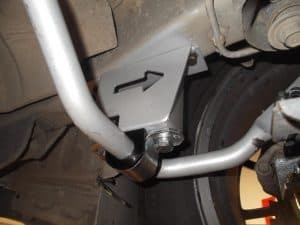 It’s this fact that makes minor adjustments to the anti roll bar a very powerful tuning method for optimising vehicle balance in terms of grip, vehicle under steer and over steer. There really is no magical formula or figure for the correct size anti roll bar to be used. To begin with, anti roll bar diameters and fitment locations are based on proven experience, then you commence testing the set up. More importantly it is the acknowledgement of the importance of the relationship between the vehicle springs and anti roll bars selected working together to provide the best outcome for a particular vehicle, tyres, track, operating conditions and driver preference. The factors are many…… You need to be always thinking. It is at this point we should take a moment to consider what really is the “golden rule” in suspension tuning………. “The end of the car with the highest level of roll stiffness will receive the largest portion of weight transfer” ….. Now weight transfer is everything. It is “weight transfer” that has a very direct effect on the net tyre grip of both tyres on that end of the vehicle. With increased weight transfer, the inside tyre quickly loses traction with the vertical loading on the outside tyre increasing traction, however, vertical load and grip is not linear (with 2 x lines on a graph, the level of grip will fall away from the vertical load)…. This is important….. !! The end result will simply be a net loss of grip over the combined 2 x tyres…. It’s from this that it can be appreciated that small changes in roll stiffness and consequent weight transfer can be used to tune vehicle grip levels and vehicle balance in terms of under steer and over steer. 1) At the most basic level and if standard anti roll bars are to be obtained, I suggest replacing the factory rubber chassis mounts and end link bushings with hardened polyurethane parts. In most cases with soft rubber, high compliant bushes there will be a massive level of compression or deflection in the bushings themselves resulting in a delay in anti roll bar operation. This is completely energy robbing and no good comes of an anti roll bar when suspended in old or soft bushings. 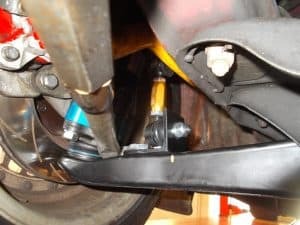 This simple modification of bushing replacement will allow the sway bar to react instantly and result in at least a sharper response in steering feel. On any vehicle with plastic roll bar end links…. It is imperative that these are replaced with lightweight alloy units. Owners of older Subaru’s please take note of this. The above is a very low cost upgrade with most poly bushings and link bushings costing no more than $30.00 per kit. Alloy links may vary from say $150-$200 though still well worth the investment. 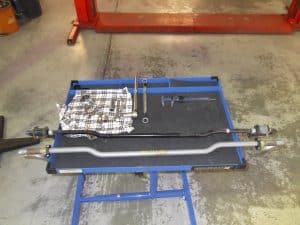 2) Anti roll bars with standard springs: For drivers seeking improvements in spirited street performance including some entry level type track work, the installation of larger anti roll bars with your factory suspension will deliver credible gains in vehicle handling making this an incredible value for the money option. It is a very true statement to make that most production motor vehicles inherit soft springs and high roll rates that make them completely underrated for any type of performance driving. Therefore, an increase in roll stiffness will never be a wasted venture. I consider this option a really good initiative as for everyday road use – the standard springs will still retain your ride comfort and feel for bumpy roads with the roll stiffness increasing when it counts and that is the moment you commence a cornering phase… Simply, standard springs with larger roll bars equals: ride comfort with increased roll stiffness / reduced body roll / greater vehicle control and tyre grip…. 3) Anti roll bars for racing and modified suspension: This is where things start to get interesting. Your factory spring rates will be completely underrated and inadequate on the race track. For track and racing you have most likely already installed a coil over suspension with springs of a higher rating. This is where I will leave the springs alone and just focus on how anti roll bars are magical when it comes to tuning your suspension for optimum performance, balance and grip. On a perfectly flat road surface it is true to say that there would be little need for any suspension at all, however, this is never the case. I believe our tracks are simply to bumpy and it is to greater demand on a spring to provide both optimum grip and roll stiffness. It should be noted at this part of the discussion that it is a softer spring that will provide greater levels of grip. Absolutely no good will come from a high rate spring that when the tyre encounters a bump in the road the whole car is lifted off the track. The suspension must absorb the bump allowing the tyre to remain in constant contact with the road surface. Secondly with minimal static spring compression there will be little rebound travel and force left in the spring to keep the tyre in contact with the road when the tyre encounters ruts and valleys in the roadway or track. It is at this point that optimising the balance of spring and sway bar choices can pay massive dividends in your set up. Consider a choice of spring that is best suited to the track conditions – Bumpy track: Softer spring… New/Smooth track: Harder spring. Then, tune in roll stiffness with your roll bars….. It is here I wish to apologise for what may seem like a vague overview…. My intention is just to drive home an appreciation of all aspects to consider when it comes to this area of suspension tuning. RWD: Going against every principle of weight transfer, in most cases you would install the larger anti roll bar to the front suspension. I see the primary reasons for this as follows….. Yes, weight transfer is increased with the increased roll stiffness, however, it is camber angle control, minimising positive camber gain on the outer cornering tyre that far outweighs in this equation. Tyre camber thrust angle is crucial in achieving optimum tyre grip. Secondly, reducing body roll from the front sway bar still means that the body roll overall will be reduced, say a little less in proportion at the rear as a result of some body flex etc….. as a consequence, this will keep the rear tyres more evenly loaded providing again an overall increase in grip from the larger front anti roll bar. So, from just the fitment of one anti roll bar at the front of vehicle there has been a net increase in grip from the front and rear tyres…. A strong word of warning: I would never fit a bigger roll bar to the rear of a RWD car… the effect of the large rear sway bar will be increased weight transfer, resulting in a net loss of grip and you also run the risk of anti roll bar lifting the inside rear wheel and tyre off the roadway in a turn that could result in a complete loss of traction and snap over steer. At a bare minimum you could end up fighting for rear traction during the corner exit phase. 1) Blade adjustable anti roll bars: Blade adjustable anti roll bars allow for fine tuning of the roll stiffness of the roll bar via the provision of multiple holes located at the end of the lever arm of the roll bar. Most blade bars will offer 3 to 4 hole positions and adjustment is made by the positioning/location of the sway bar link into the selected anti roll bar positioning hole. The link hole positioned at the end of the lever arm is the soft setting and the shortest length link hole in the arm is the hard setting. In every case, if you have an option between a fixed position anti roll bar and a blade adjustable anti roll bar, I would choose the blade bar every time as it would be well worth a small increase in cost to have the extra sway bar tuning options and capacity. 2) Anti Roll bar/(Sway bar packages): Many suppliers that include Whiteline and Super Pro offer sway bar kits that include front and rear sway bars sold as a package. It is difficult for me to comment on this fitment option due to the many variables that I consider would need to be taken into consideration. I believe every car needs to be considered and assessed on a case by case basis. I will only assume that the suppliers initially consider deficiencies and weaknesses in the new car vehicle package via prior road and track testing, then conduct considerable development and testing that involves handling improvements based on reducing roll angles and improving handling balance and grip. Whilst I believe all these packages would deliver high levels of handling improvements, I just sometimes wonder on what platform/level of modifications these packages were built or based on…. Package kit developed for a car with standard springs…. Package kit developed for vehicles with coil overs or certain higher spring rates. Package kit developed for all levels of suspension modification….?? What were the actual specifications of the development vehicle. Just my opinion…..
3) Lateral locks: Yes, a must for all anti roll bars…… Please refer to attached photo. An anti roll bar lateral lock is a split collar and they are always fitted as a pair directly inside the sway bar mount bushing. In all cases the anti roll bar must be locked from any side/lateral movement. Without the fitment of a lateral locking device, the anti roll bar will move sideways in the mounts during operation. This once again is an energy robbing movement within the anti roll bar that will rob reaction time….. I really like the Whiteline lateral locks…. 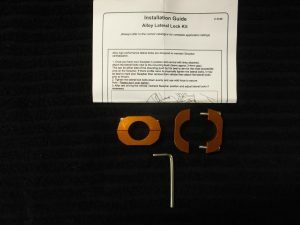 They are available in a range of sizes and average about the $40.00 per kit. Most new anti roll bars will come with lateral locks as part of the kit, however, if not supplied or already previously installed, the fitment is a must and completely worth it. My intention for this article is just to provide an insight into the Road2Race way of thinking on the topic of anti roll bars…… I believe there is a place for anti roll bar modification and tuning ranging from your everyday road car to all levels of motor sport….. They must not be discounted – only considered a valuable component of a successful handling motor vehicle. 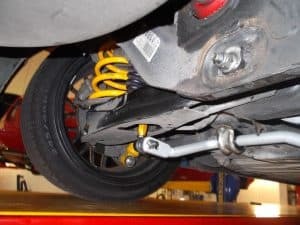 All too often I am faced with situations where clients have been advised to remove them with the install of a coil over suspension system, only to find they have refitted them and achieved a better outcome. Honestly, there are no right or wrong answers….. all variables of the car, level of modifications, springs rates, tyres, vehicle intended usage must be considered. Case study for a road vehicle fitted with coil overs and a spring rate package biased for the street…… Great…… Compliant road friendly ride with a larger anti roll bar to reduce body roll when you choose to push a little harder through a set of corners.